Just how is it that some pilots seem to stay up longer than others in the light stuff? Are they light on the wing? Is it the wing itself? Or do they employ some magic techniques that you don’t know about? Being lightly loaded, near the bottom of the weight range on a wing will almost certainly help you to waft about in the light stuff and minimize your sink rate. And some wings, particularly the higher-rated wings will often have a slightly better sink rate than some of the older and or lower end wings. But what about pilot ability? Does the pilot flying the wing really make that much difference? Almost certainly, the answer to that question is a big fat “YES!” So exactly what techniques are they using? And how can you be that last pilot in the air on the light lift days? Read on, to find out how to exploit every last drop of precious updraft. Learning how to exploit weak lift is a critical skill to develop if you want to stay in the air when conditions get light and “tricky”. Being able to exploit weak lift can keep you in the game between the “easy” thermic cycles. It can even help you milk a few extra kilometres at the end of a long xc flight. Pilots that are good at using weak lift are usually the very same pilots that are good at getting high quickly on the booming days. Here are the keys to milking the weak stuff. The first and most important key to making the most of weak flying conditions is learning how to use the “minimum sink setting” on your wing. A wing’s performance at different brake settings is described graphically by the polar curve. Most modern LTF 1 to LTF2 (EN-A to EN-C) wings have a sink rate of about 1.1metre per second (or approximately 220 feet per minute) whilst flying “hands-up” (ie no braking). However, whereas flying “hands-up” usually approximates to “best glide” on a modern wing, this is certainly not the same as minimum sink rate. The minimum sink rate of a glider is the absolute lowest possible sink rate that can be attained or the smallest amount of height loss per unit of time. It is usually achieved by applying a significant amount of brake. Whereas with “hands-up” you might find yourself with a sink rate of about 1.1m/s, by flying at minimum sink you can achieve a sink rate of closer to 1m/s. Although this might not sound like much of a difference, a small difference of say 0.1m/s will equate to a 6metres (20feet) per minute! 6 metres of height difference per minute IS significant and in very light conditions this will often be the difference between just staying in the lift-band and just falling out of it! Exploiting the minimum sink “setting” is often the main difference between the pilots that eek it out for another half an hour and those that slip below the lifting air and head for an early bomb-out. 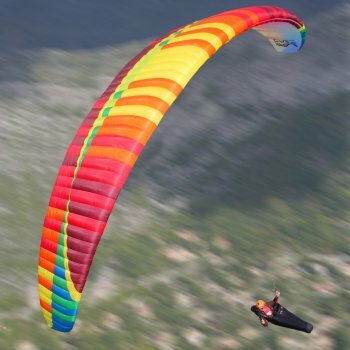 In my experience of guiding hundreds of paragliding clients over the years, pilots rarely use this “setting” on their wing. Indeed the majority of pilots have one setting: a little bit of brake. The minimum sink of your glider is found with a lot more brake than most pilots realise. On a medium sized LTF1/2 wing the amount of brake required to achieve minimum sink is a good 30cm or so of brake. The amount of brake required will of course vary considerably from wing brand to wing size and whilst that point is more brake than most pilots think, the risk of applying too much brake cannot be overstated. Applying too much brake can take you into the unsavoury world of stalls and spins. If you are in any doubt then I urge you to risk applying too little rather than too much! And, always be ready to release some brake as the wing pitches back when encountering lift or gusts of wind – to keep you safe AND efficient. Get to know your wing by ground handling and attending a well run wing control course. The second key to getting the most out of weak lift is using your wing efficiently by flying smoothly. In weak lift pilots who let their wings roll and dive around will find that they’re very quickly setting up for an early landing. Keeping your actions smooth, progressive and fluid is the key to being efficient in any air, and this is particularly important in the weak slow scratchy stuff. Use your controls to damp wing pitching and use your harness to damp out roll so as to keep your wing as flat as possible. Explaining exactly how this is achieved is probably the subject of another article so if the “how to” is a mystery, then for now just think about keeping everything as smooth as possible, sit still in your harness, try not to over compensate and you’ll be well on the road to piloting your wing with greater efficiency. In weak conditions we often find ourselves confined to a small ridge. Perhaps we’re enjoying an evening soar-about, or perhaps we’re hoping to ride out the weak stuff until the next thermal shows up. In weak and “scratchy” conditions it’s important to spend as much time as possible in rising air and as little time as possible in the sinking air. That might sound obvious, but it’s in these conditions that more often than not most pilots seem to wait until they’ve been through a little section of lift before then turning in the sink the other side of it! So if you want to perform better than most pilots, turn in the lift!! When turning 180degrees we spend some 10 to 15 seconds in one place. If that place happens to be lifting then we’ll be going up. If like most pilots you boat through the lifting air and then turn in the sink (perhaps with the idea of boating back through the lift?) you will be spending considerably more time in the sink and speeding straight through the lift. Don’t turn in sink unless it’s to go back for something good and certain – something that’s worth going back for! Get through the sink hands high and fast (don’t spend time there!) 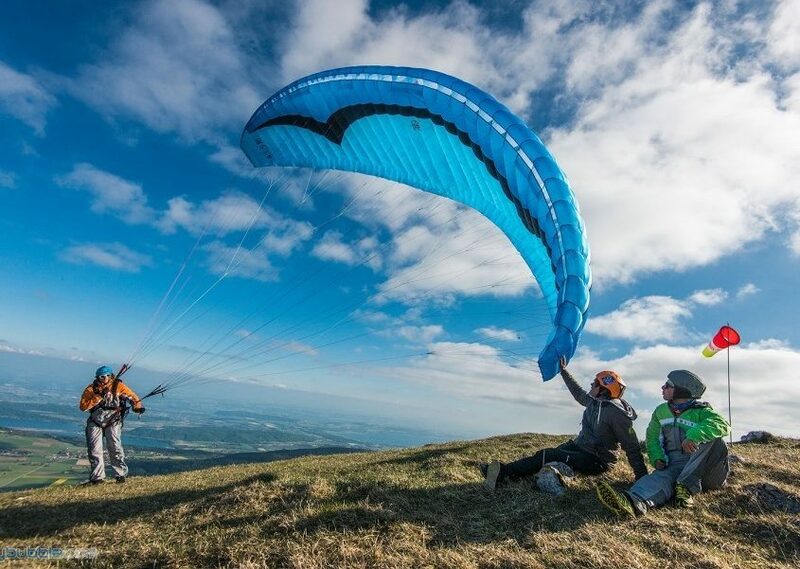 and then should you happen upon a bit of lift carve a sweet smooth and slow turn to maximise efficiency of the wing and spend as much time in the scarce lift as possible. When you’re desperate for lift you don’t necessarily have the luxury of being able to explore the edges of the thermal (and perhaps risk falling out of the thermal!). So if you’ve been in lift for more than about 4 seconds it usually makes sense to turn! Turn before the sink and you’ll be doing better than most other pilots in the air. Even when conditions are light we often find conditions that are “cycling”. This means that as a lift cycle comes through it is usually relatively easy to stay up and might even be possible to climb. Usually between lift cycles, conditions can become much more challenging. If this is the case, then the key to staying airborne is to get as high as you can with each lift cycle so that you have as much altitude as possible to use up (as slowly as possible) in order to survive until the next lift cycle strikes. The gap between cycles can be as little as a minute and up to several. If lift cycles are sparse and irregular it is even more important that you don’t content yourself with just surfing at ridge height during the “good times”. If you happen to be playing at a site that is top-landable, these are exactly the conditions in which you will see good pilots taking off at the beginning of the cycle only to slip in for a sneaky top landing as the cycle dies to wait until the next cycle presents itself. When the time between useable cycles is long and “sinky” this is a good game to play and is sure to enhance your awareness of the subtleties of lift cycles. Whilst eeking it out in the weak stuff has something to do with which wing you fly and a little to do with where you are on the weight range, much more important is the flying techniques that you employ. Learn to fly at minimum sink. Learn to fly smoothly and efficiently, turning in lift and spending as little time as possible in the sink. Be sensitive to how the thermals cycle. Have fun staying up in the air for longer and longer… and a little bit of luck always helps…Good luck! If you like this article and want us to send you more, just sign up with the button at the bottom of this so we can keep sharing.